This is another Nike N98 jacket, made specially for Portuguese giants FC Porto. Porto form one of the big three of Portuguese football along with Benfica and Sporting CP. The FC Porto N98 track jacket has been made by Nike for the 2010 season. The track top uses the colours of black and yellow, as can be seen from the photo below. This entry was posted in Portuguese Liga and tagged N98 on November 9, 2010 by Football Kit News. This is the N98 Werder Bremen Track Jacket 10/11. Nike have manufactured this track top for the Green Whites as part of their N98 series. Werder, who are a strong force in the Bundesliga and regularly feature in Europe, also have their kits made by Nike. The Werder track jacket contains two varying shades of green- one for the body and the other for the collar and cuffs. There is also a hint of white down the sleeves and on the back. The word Werder is written on the back of this jacket in white. This jacket also contains the Nike swoosh and the Werder Bremen club logo on the front. This entry was posted in German Bundesliga and tagged N98, Nike on November 2, 2010 by Football Kit News. This is the Juventus track jacket, made for the Bianconeri for the 10/11 season by Nike as part of their N98 track jacket range. The jacket is the colours of black and white, which are the traditional home colours of Juventus. This entry was posted in Italian Serie A and tagged Juventus, N98 on October 16, 2010 by Football Kit News. This is the new PSV Eindhoven track jacket, made for the club by kit maker Nike as part of its N98 range. PSV’s kits, including the 10/12 PSV home shirt, are currently made by Nike. 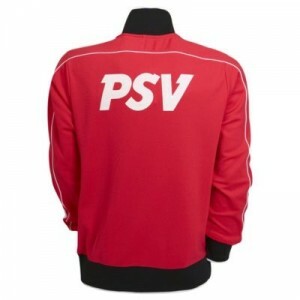 This stylish PSV jacket uses the colours of red, white and black. The body of the jacket is mainly red in colour, with white being used on the sleeves and on the collar. On the back, the words PSV are inscribed in white. 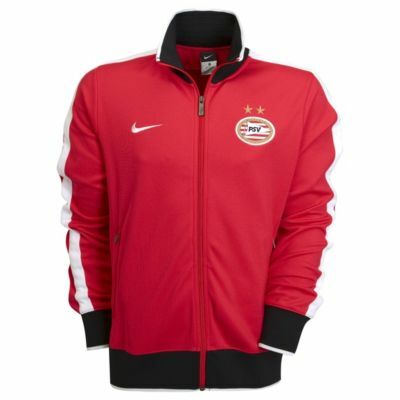 This PSV track jacket also contains the club logo and the Nike swoosh. This entry was posted in Dutch Eredivisie and tagged N98, Nike on September 14, 2010 by Football Kit News. Here is the Celtic N98 jacket, made for the Hoops by Nike. The sportswear giant has designed two jackets for Celtic as part of its N98 series, one in green and one in white. Celtic’s kits for the 10/11 season have also been made by Nike. This entry was posted in SPFL/Scottish Premiership and tagged N98 on August 27, 2010 by Football Kit News.